If you like to play video poker online, we have good news: Jacks or Better Power Poker by Microgaming is a perfect example of the genre. Jacks or Better games are based on five-card draw poker, and your goal is to form a winning poker hand. 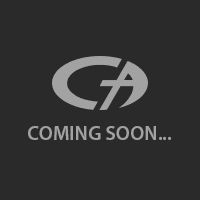 The interface of the game is clear and easily understandable. To the left, there is a paytable. All winning poker hands and their payouts are shown in this table. For example, if you manage to get a hand of Royal Flush, you are awarded 4.000 coins. Jacks or Better games are known for their high (and frequent) payouts, and this one is no exception. Although, the game differs from other Jacks or Better games by its setup: as you can see, there are four separate poker hands on the screen. This means you can play the game using up to four hands at once. Same bet amount applies to all hands and your winnings odds are very high, because each time you click the “draw” button, you get four independent card sets. This also means payouts are separate too; you can form a winning hand at each set and get paid for all of them at once. To start the game, click on the “draw” button. You will get 20 cards and you have the option to “hold” any ones you like. Just click on the cards you want to keep and hit “draw” again. Your next (and last) set of cards will appear and if you manage to form a winning poker hand in any set, you will be awarded. 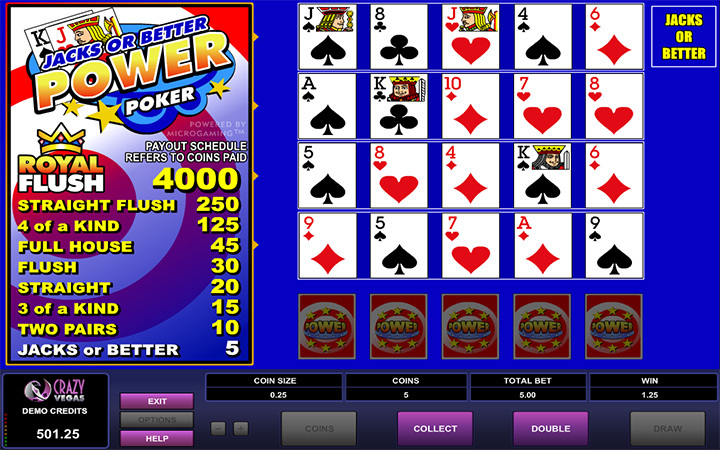 Jacks or Better Power Poker game has a “Double” feature too. You can double your wager any time by clicking on the same named button. But let us remind you that if you lose, your losses will be doubled too. You can play with 1 or 5 coins, the maximum bet is also 5 coins. To get the highest possible payout, we recommend you to always play with 5 coins. Jacks or Better Power Poker is a simple yet awarding game, and you can play it completely for free at Casino Ave. No download and no registration are needed, just click on the “play demo” button and enjoy – play at Casino Ave for more casino games.